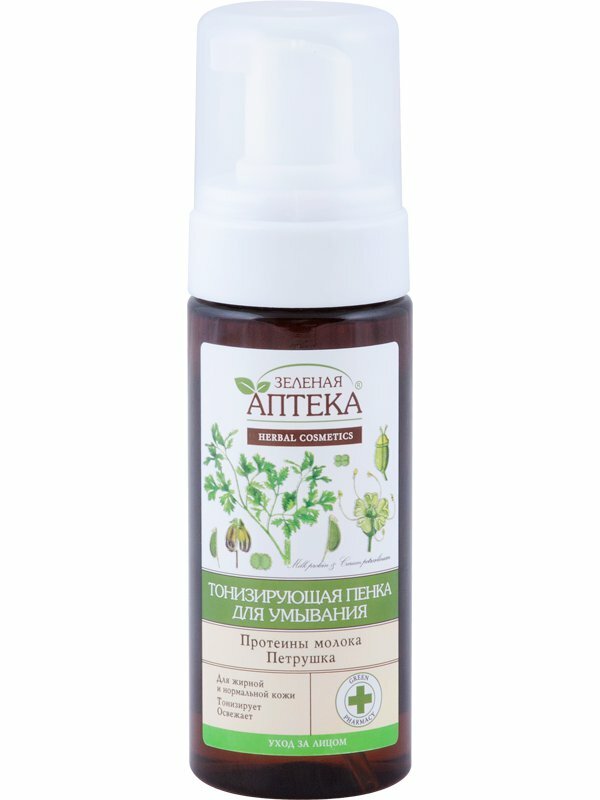 Revitalising Foam Cleanser is produced by the Ukrainian beauty brand Green Pharmacy. The product is formulated with hydrolysed milk protein and parsley extract. It gently cleanses your skin, has a refreshing and revitalising effect. Does not dry your skin. Designed for oily and normal skin. This delicate revitalising foam cleanser effectively cleanses your skin and prepares it for further care, opening pores so that the skin better absorbs skincare products. Hydrolysed milk protein and parsley extract contained in the cleanser help to soften and soothe your skin and have revitalising properties. The cleanser has a light, airy texture and a pleasant, natural scent. The bottle has a convenient dispenser which eliminates costly waste. Directions. Apply a small amount of cleanser onto wet skin, massage lightly, rinse with warm water. Ingredients. Aqua, Sodium Myreth Surfate, Cocamidopropyl, Betaine, Glycerin, Cocamide DEA. PEG-40 Hydrogeneneted Castor Oil, PEG-7 Glyceryl Cocoate, Disodium Laureth Sulfosuccinate, Carum Petroselinum (Parsley) Extract, Humulus Lupulus Extract, PEG-12 Dimethicone, Hydrolyzed Milk Protein, Panthenol, Polyquaternium 10, Parfum, Sulfurized TEA-Ricinoleate, PEG-35 Castor Oil, Propylene Glycol, Benzyl Alcohol, Methylisothiazolinone, Methylchloroisothiazolinone, CI 19140, CI 42090. Want to buy Revitalising Foam Cleanser? Call us or submit your order via our web site!